The annual K-12 Art Show at the HUB Robeson Gallery on the Penn State campus features 152 State College Area School District student works. 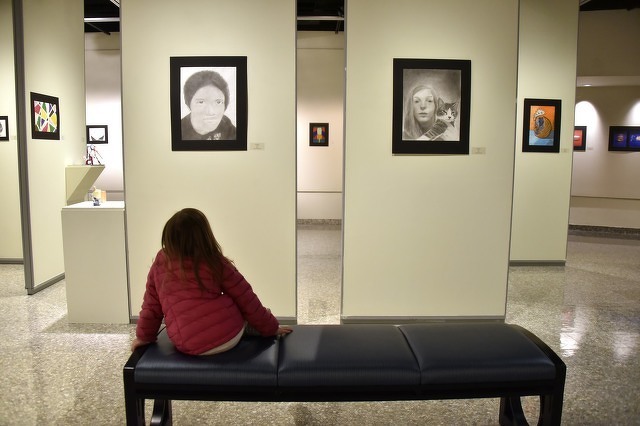 STATE COLLEGE — State College Area School District students’ artistic talents are on full display this month at the HUB Robeson Gallery on the Penn State campus. In its final year in the gallery, which is slated to be converted into office space, the annual K-12 Art Show features 152 student works representing sculpture, painting, drawing, photography, fiber, mixed media and ceramics. Eighteen district art teachers selected up to 10 student works for a professionally designed, hung and lit show, which will culminate Jan. 26 with a reception from 2 to 4 p.m. The gallery is open noon to 6 p.m. Monday to Thursday and noon to 4 p.m. Friday to Sunday. She noted her sixth-graders “still remember the honor” of being chosen for the show as second- or third-graders. “There is a genuine smile on their faces and a lift in their speech when they tell me about it,” she said. “We need more of these uplifting opportunities for our artists. It will be them who go on to influence our culture through their visual means. Isn’t it right and noble to show them we value their art making early on?"